Does video worry you? 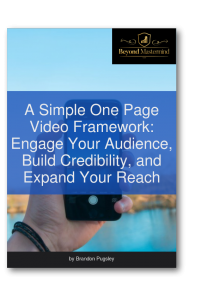 Here's the simplest video template, ever! Video is the most impactful medium we have available to us if you’re looking to drive business and build an audience. It’s also the channel that tends to “freak-people-out”! So, first myth is that you have to use a face-to-camera video. You don’t need to do that if you don’t want to! Do you known that just hearing your voice actually has an impact on how much people trust you, and it builds over time and repetition. As a entrepreneur, I expect that you’re looking to engage people who want to buy from you. While written blog posts and traditional content has its place, we are forever dealing with an audience on their phones. The chances of people reading a post are a lot lower than someone watching your video! Do you know where to begin? I have a 1-page video template that you can begin using today to take away some of the stress and get you going. The video below (which is short), gives you a few pointers and shows how I use it every day. P.S. I think that YouTube just looks for the craziest picture they can find! Use this video template to help you relax and build an outline that will help you use video effectively! Previous Post Leadership, Experience, Adventures, and Memories Next Post The First Rule of Change is…to PANIC!